When cruising for a long time, there’s a risk of becoming jaded – after countless beautiful anchorages and waterways ringed by snow capped mountains, eagles calling overhead, it can start to feel the same. When this starts to happen I remind myself how lucky we are to be cruising in one of the best areas of the world, and any jaded feelings quickly fall away. Even though we sail through a seemingly repetitive slideshow of evergreen forests, panoramic vistas, sea life, mountains, and pristine water, there’s always something new happening to break you out of any affectation of beautiful monotony. Perhaps a rare clear night where you see more stars than you’ve ever seen in your life. A humpback quietly surfacing near your boat, or a riveting downwind sail. 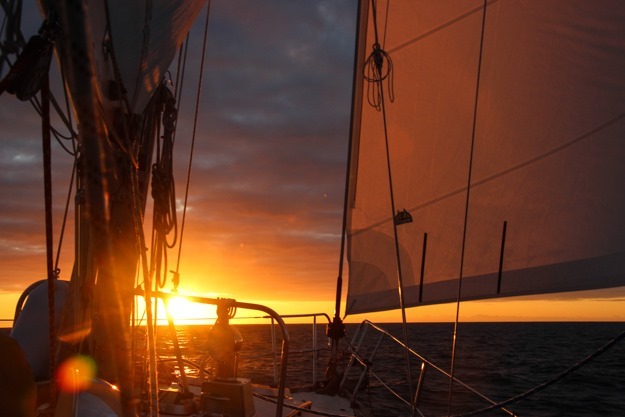 The cruising life has its hard moments, but it’s rarely boring. While cruising we’re more connected with nature than we ever were in the city. It feels like long ago that we cast off the lines from our live-aboard community at Shilshole, but it’s only been two months. In month one, we traveled from Seattle to the Octopus Islands near Campbell River, BC. In the last month, we’ve come a long way: from the Octopus Islands to Haida Gwaii. 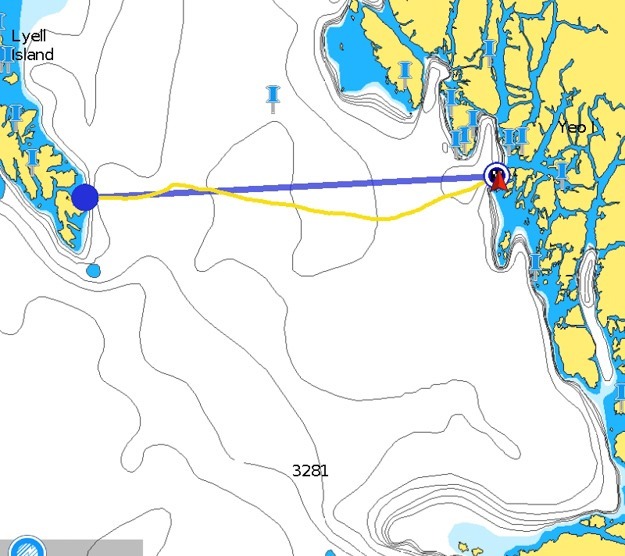 We relaxed in the Octopus Islands, got lucky with a fantastic quick passage of Johnstone Strait, hung out in the Broughtons for a bit, and then rounded Cape Caution. Going around Cape Caution was hard, but then we had awesome, easy sunny days on the Central Coast. From Shearwater we headed up the North Coast of BC, and had a very rainy 3 days stay at Clark Cove waiting out a gale. Our luck with wind ran out and we had a slow, frustrating crossing of Hecate Strait to Haida Gwaii. Approximate route (follow the blue line). This entry was posted in cruises, trips on June 9, 2018 by Patrick. I’m never sure whether readers of our blog are interested in hearing about travels we do off the sailboat – like Mexico last year. But since Thailand is a pretty major cruiser destination, I figure it might be of interest. We flew to Thailand the day after Christmas for a two week vacation, visiting Bangkok for 5 days, Patong Beach in Phuket for 3 days, Phi Phi island for 3 days, and Naiyang Beach, Phuket for the final day. 2 full days were consumed by the plane travel from Seattle (22-24 hours travel time). Of course, I viewed much of Thailand thru the perspective of sailing and other cruisers’ experiences there. Delos has been to the Phi Phi islands that we visited on our trip (Delos in Southern Thailand and Phi Phi Islands). The prior-prior owner of our boat actually bought it to sail to Thailand, and after a year of prep work decided it’d be easier to fly there and charter. I’m inclined to agree. We rewatched the Delos episode. It was really interesting seeing our different perspective on it this time. It still looked awesome and fun, but we could see all the things they had omitted. They avoided the most touristy bay, briefly mentioned the party beach’s loud music keeping them up at night while at anchor (a 5-second clip that would be easy to miss), and snuck into a park that charges a high tourism fee (I think they said 300 baht, but it’s 400 baht now). I don’t blame them – they’re catering to their audience, most of whom are not going to sail to Thailand, or necessarily anywhere else. Those people only want to see the fun times, and discussing practicalities won’t get you a quarter million followers on YouTube. This entry was posted in food, trips on January 9, 2018 by Patrick. This year’s 1-month cruise took us from Seattle all the way to Nootka Sound, more than half way up Vancouver Island’s west coast. Starting from Seattle, we had an upwind slog getting out the eastern Strait of Juan de Fuca to Victoria, followed by a relaxing five days exploring Barkley Sound’s quiet anchorages. We next went up to Clayoquot Sound (after one false start due to awful wave conditions). We didn’t stay long in Clayoquot, heading up to Nootka Sound to see how far we could get. We had fun exploring Friendly Cove, but someday will have to come back when we have more time to explore Nootka. It was time to turn around back south, so we headed to Tofino and picked up an unwelcome stowaway for one night. We stopped in Barkley Sound again, regretting we didn’t have more time to stay in this most epic of sounds, and headed back down the Strait of Juan de Fuca. Fortunately we had some time to relax in Victoria, checking out some anchorages we normally wouldn’t have time for. Passing through the San Juans they were as beautiful as always, but sadly it was soon time to return to Seattle. A month sounds like a lot of time, but it’s really not, at least not when you’re trying to cover ground by sail. About 3 weeks in we realized we had packed the schedule a bit too tight, and probably shouldn’t have stretched to go to Nootka Sound. While it was cool to reach our farthest point north on the west coast ever, we had many long and tiring days and not quite enough short days or lay days. It’s important to have balance in a cruising schedule. I often think of it like a video game – if you always have the difficulty setting on “hard”, you’ll get burnt out. Most days going up the west coast are medium or hard difficulty, so we needed a few more easy days in the mix. Fortunately the last week, in the Victoria area and San Juans, provided some nice easy days. View of our route with the return leg plotted as well. This entry was posted in cruises, trips on August 18, 2017 by Patrick. Tonight we cast off the lines for our third annual summer cruise, following a similar route to the one we did two years ago up the west coast of Vancouver Island. It’s hard not to be overwhelmed with excitement, but we also know there are some challenging waters ahead of us. Our first big cruise two years ago was a bit of a reality check, making us aware that ocean waves can be much more difficult than we expected, and that some of our sailing skills weren’t quite as good as we thought (in particular, we had little high wind experience). We’re hoping this time it will go a lot better. Besides having a great deal more experience, the boat is in better shape now – having 2 ½ years worth of projects done rather than just 6 months worth. Two problems that stressed us last time – engine troubles in the Strait of Juan de Fuca, and a gradual transmission failure – shouldn’t happen again. Things have been really busy the last month – after moving aboard (becoming full-time liveaboards) there was a flurry of projects and chores to complete, along with some great sailing to the San Juans and a couple local destinations. So I don’t really have much time to write more about our planned trip, and will just refer back to this post from two years ago for our approximate route. 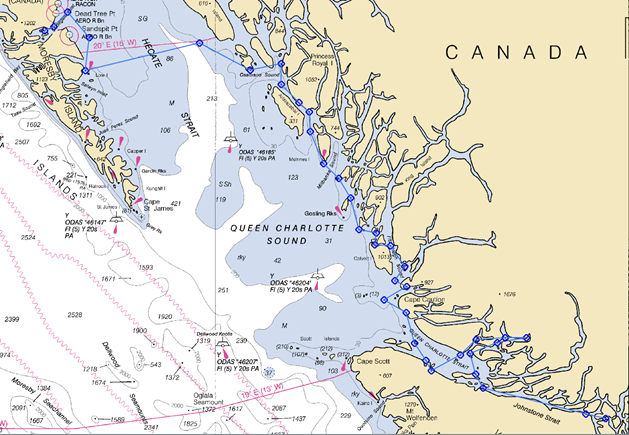 This time however, we’ll be going up the Canadian side – Victoria to Becher Bay to Port Renfrew to Bamfield. This entry was posted in cruising plans, trips on June 30, 2017 by Patrick. “Fish on!” was called out across the boat. It was my turn in the fighting chair – 9th in a lineup of 9 on our charter in the Bay of Banderas. Everyone else had caught yellowfin tuna, so I was expecting that was what was on the line. But immediately it was clear this was something very different. The line on the spool started running – fast. The spool was at max tension, but it did nothing to slow this fish as it dove deeper and deeper. The two Mexican crew running the boat looked at each other and started speaking in Spanish, too fast for me to understand. El marlin negra – black marlin – is what they think was on the line. Black marlin can grow to 10+ feet in length and hundreds of pounds – a whole different story than the 20-40 lb 3’ yellowfin tuna. The captain stopped the boat and they told me to go slow, a long fight was on my hands. The fish kept running – 100 feet, 200 feet, maybe 300 feet of line spooled out. The line was going straight down, and was so tight you could play piano notes on it. As he kept running we started worrying the spool was going to run out of line. Finally he stopped and I worked hard to bring that line back in. It was a full body work-out pulling the rod up and then coming down, cranking the spool hard, repeated again and again. Then the fish started running again, careening way off to the side, and the line started running out – losing 100-200 feet or so of my progress. At times I could only stop and rest, shaking my numbed arms to bring some life back into them. I was out of breath and drenched in sweat. This was more of a workout than I imagined fishing could possibly be. Eventually I passed the torch to the next in the line-up – Natalie – and she fought the fish for a while. In the end, four different people took a turn, but as we were transferring to the 4th person, the marlin (we think) snapped the lead on the line, and we came up empty handed. It sure would’ve been great to see what it was. But, the experience was worth it in itself, and we had some delicious yellowfin tuna for dinner that night. This entry was posted in trips on April 3, 2017 by Patrick.